How can I show the full notifications in the notification center? I cannot read the full notification (see attached). How can I? Notification Center limits the size of a notification to 256 bytes (see developer reference), so there is no way to expand or change how much of a notification you see (unless you can find some third-party application that disables the limit). After 256 bytes, the notification will be truncated and the user has to click on the notification to see the rest. For example, if Mail.app sends you a notification of a new message, you likely won't be able to read the whole message from the notification, so you'll have to click on it to open the message in Mail. However, if the notification is purely informative and does not point to a specific piece of data within the application, when you click on the notification, it will only open the application or, if it is already running, bring it to the foreground. 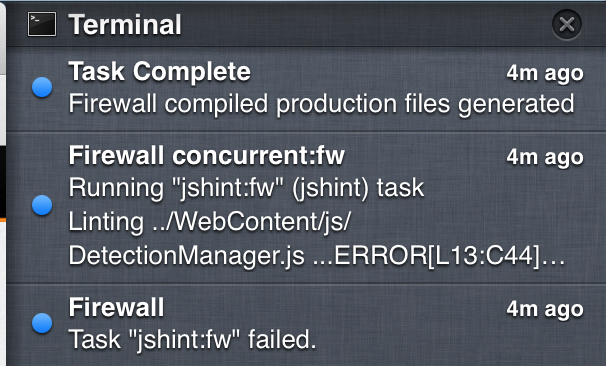 Terminal is not a UI-based application, so notifications from it are not going to focus on a specific element. A notification from Terminal will simply open the application because its notifications are plaintext messages from the application that don't point to a specific UI element or piece of data. Short answer: You cannot. You need to click on the notification to read it. There is no long answer here. Not the answer you're looking for? Browse other questions tagged terminal notification-center . How do I add all Tweets to the Mountain Lion Notification Center? Does the OS X log notifications from the Notification Center? How can I keep notification center enabled, even when I'm in a full-screen app? (How) Can I push notifications from my Mac notification center to my iPhone?